DETROIT (AP) Detroit coach Stan Van Gundy was worried that his team might suffer a letdown after going to Boston and beating the first-place Celtics. It didn’t take the Pistons long to end his worries. The Pistons led by as many as 33 points in the first half and went on to win their third straight game, beating the Phoenix Suns 131-107. Detroit beat the Celtics 118-108 on Monday night. Devin Booker led the Suns with 22 points, and rookie Josh Jackson had a career-high 20. Phoenix has lost four out of five and is 1-2 on a six-game trip. The Suns were coming off a 104-99 victory in Chicago on Tuesday night, while Detroit had Tuesday off after the win in Boston. Harris scored 14 points and the Pistons had a season-best 36 points in the first quarter. Detroit shot 62.5 percent in the period to build a 17-point lead. Phoenix continued to struggle in the second, falling behind by 32 points. Detroit led 69-41 at halftime, outshooting the Suns 63 percent to 44.7 percent. Harris had 16 points in the half, and Reggie Jackson added 15. The Pistons led by as many as 36 in the second half. Suns: Josh Jackson spent his first two years of high school at Consortium (now Voyageur) Prep, located four miles from Little Caesars Arena. . One night after using 7-footers Tyson Chandler and Dragan Bender as his starting center and power forward in Chicago, Suns coach Jay Triano changed things against the Pistons. Marquese Chriss and former Piston Greg Monroe started, while Chandler didn’t play. Pistons: Drummond hit all three free-throw attempts against Phoenix, and is shooting 63 percent from the line this season. Drummond entered the season as the worst free-throw shooter in NBA history, having made 38.1 percent of his attempts over five seasons. Suns: At Boston on Saturday. 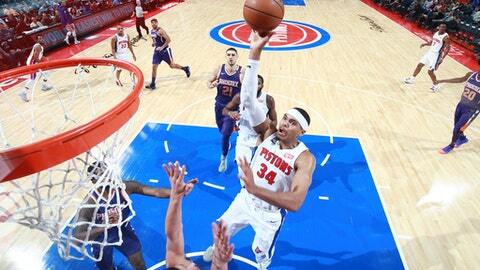 Pistons: At Washington on Friday night.